If you’ve been following Healing Cuisine for long enough, you know that I am very passionate about not only organic eating, but organic living as well. Whether it’s healing from illness naturally, eliminating plastics or other toxins from your home, or using all-natural eco-friendly cleaning products, it’s what I love to do and thus advocate taking these steps. In fact, Dr. Dave and I are hosting our Defeating Toxicity workshop on Tuesday, March 15th at 6:00pm at our Maximized Living Health Center. If you live in the Orlando area, sign up and come on over to dive into a wealth of knowledge on how toxicity affects our lives negatively, the best and worst products for you and your family, and ways to detox your body naturally! We’ll give you all the tools and solutions you need to clean up your daily routine! Today, I want to talk about a company on a mission to green our day-to-day lives. Seventh Generation provides user-friendly products specifically designed to fit our needs while protecting the health of our environment and us (the consumer) at the same time. While I could go on and on about the dangers of cleaning products, and the chemicals in our baby diapers and wipes, and the fragrances and dyes and chlorine and pesticides, etc, etc, in our laundry soaps and feminine products. Instead of focusing on the bad and the ugly here, come to our Toxicity workshop. Not in Orlando? Visit the Environmental Working Group’s website and become an educated consumer. Here, I want to focus on the solution to the problem. If you are ready to cut out the hazardous chemicals from your life and switch to all-natural options, SAFE for not only you but your children as well, then I encourage you to try the Seventh Generation product line. The company was so kind so send me a Healthy Home Starter Kit, so now I can proudly say I’ve tried just about every product they have to offer! The Healthy Home Starter Kit includes: Disinfecting Multi-surface Spray , Disinfecting Bathroom Spray , Disinfecting Wipes , All-purpose Free & Clear Spray , Glass Free & Clear Spray , Shower Spray , Toilet Bowl Cleaner , Tub & Tile Spray , Natural Paper Towels , and a Seventh Generation recycled shopping tote. I mean, WOW! I got to try it all, and can I tell you, IT WORKS! I had been a huge advocate of the disinfecting wipes, toilet bowl cleaner, and the free & clear all-purpose spray in the past, I even use these products to clean our clinic. Now that we’ve relocated to Orlando and we are living with 4 other people who share our bathroom, it was time for a true test for the Seventh Generation cleaning products. I am so pleased! They work wonders! The glass spray is a new found favorite, as well as the tub & tile spray. And what’s the greatest part? All of the Seventh Generation products are made free of harsh chemicals, scented naturally, plant-based, biodegradable, hypo-allergenic and non-toxic. AND, Seventh Generation discloses all of its products’ ingredients right on their labels (did you know there aren’t laws in effect that mandate this measure??). Label reading doesn’t just apply to food. It MUST apply to every purchase you make, food, clothing, body care products, and cleaning products! In my opinion, this gives Seventh Generation a huge boost in the credibility and consumer safety departments. I also love what Seventh Generations stands for. From the Great Law of the Iroquois: “In our every deliberation, we must consider the impact of our decisions on the next seven generations.” Seventh Generation firmly believes in this philosophy and thus derived their company name from this principle. From their non-toxic products to their 100% recycled paper products to their recycled and recyclable packaging. Their mission is, “To inspire a more conscious and sustainable world by being an authentic force for positive change.” Every Seventh Generation product that you purchase and use will help save natural resources, reduce pollution, and keep harmful chemicals out of our environment. 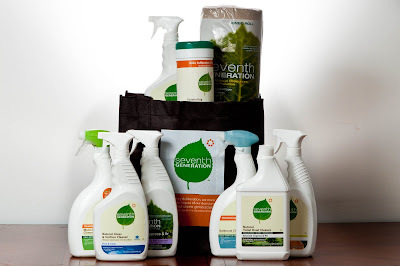 I encourage you to try your first Seventh Generation product, if you haven’t experienced the company yet. Or, expand your scope. Maybe it’s time you switch to their natural feminine care products or their recycled paper towels. Take that next step to further clean up your life! 1) Become a Google Follower of Healing Cuisine AND visit the Seventh Generation website. Leave me a Comment at the bottom of this post about one product they carry that you didn’t know about or hadn’t tried before. 3) Click the “Share on Facebook” button at the bottom of this post, @ mentioning me (@Healing Cuisine or @Elise Schwartz) so I see you’ve shared the contest! You can purchase Seventh Generation products at your local grocery store, Target, Walmart, or online at Vitacost.com or Amazon.com. You can also find money saving coupons online at http://www.SeventhGeneration.com/. I was not aware of the paper towels and other paper products available. Kool stuff! Thank you for the eye-opener! Nice giveaway! I didn’t realize they also made paper towels and other paper products. I’ve used some of their cleaning supplies and love them. Thanks, Elise! I love the wipes. They work well and not too perfumed. I did not know that they also made diapers. I’m curious to try those out too. I follow your blog. I didn’t know about the disinfecting wipes! I’d like to try them! I follow you and Seventh Generation on facebook. I also shared this giveaway on facebook. Thanks all for your entries!! Still a couple hours left if you’re thinking of getting involved! Tune in tomorrow morning to find out THE WINNER!! :D Good luck to you all! I didn’t know they made a glass spray. I have been looking for one without all the chemicals. Can anyone recommend products/collections that don’t contain SLS? ← Seventh Generation Giveaway WINNER!! !